Some websites receive millions of visitors from search engines. Others are left with just a couple of occasional surfers. Yeah, search engines are really hard to tame. But here's a magic whip that will help you get search engines working towards your bottom line. This unique free SEO guide will teach you the best, real-life tested optimization techniques professional SEOs would hate you to know. Search Engine Optimization or simply SEO is hot these days. It's so hot that the cyberspace is boiling with all sorts of SEO books, paid online courses, manuals and what not. They are stuffed up with theory and professional slang that few people will understand and even fewer really need to know. SEO in Practice is different. It speaks the language you'll easily understand and only preaches the techniques that are worth your time and effort. This practice-driven SEO guide tells you exactly what to do to see your search engine rankings skyrocket pushing your traffic and sales to the outer space. Step by step you'll be learning the ins and outs of effective SEO and applying them to your site right away. You don't need to read the whole book to get started. As soon as you've mastered a new technique you immediately make use of it and reap the benefits. The course doesn't require any special skills, knowledge or money. All you need to run your own SEO campaign is desire to invest some time in promoting your website in search engines. Just follow the detailed guidelines and watch your website climb up the ranking ladder. 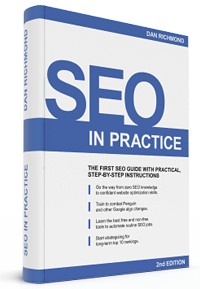 Each chapter of this SEO book will get your website a step closer to becoming #1 in Google and other search engines. At the end of each section you will find a quiz where you can test your newly gained knowledge. Once you've successfully finished all quizzes you get a special SEO Certificate to prove your expertise. But the main point is that once you've put your SEO skills into your website you'll get mammoth exposure, immense flow of visitors and outrageous sales growth. So what are we waiting for? Get your motors running! Please log in to get full access to SEO in Practice. Or aren't you registered with SEO in Practice yet? You still have a chance!